If we thought Mumbai couldn’t get any crazier, we’re wildly mistaken. A stroll around Matunga market threw up a surprise that’s as unique as it gets. Silver Elegancee, a costume jewellery store, catering to the needs of all the classical dancers in the city and outside, has scores of jewellery sets meant for any Indian dance form. Take a look at what we found. 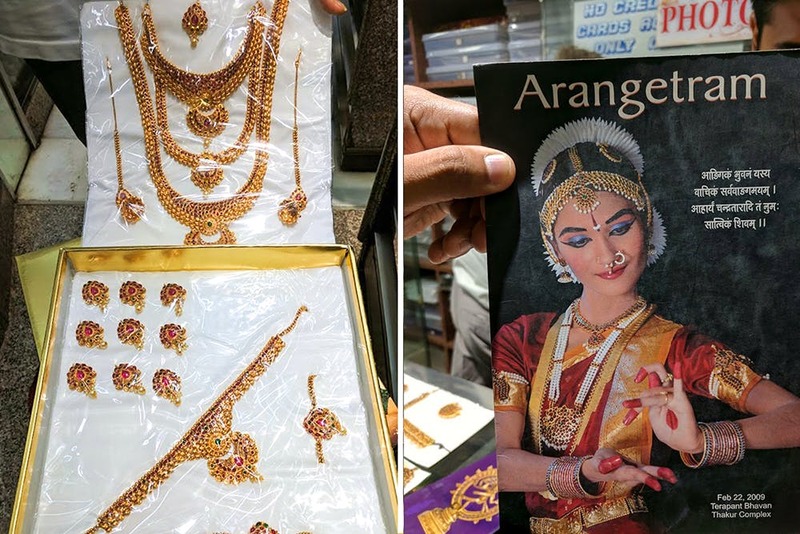 Catering to a wide audience (when we visited the store, there was a mother on skype with her daughter who bought three Arangetrum sets), they have jewellery in different designs, materials and price ranges for Bharatnatyam, Kuchipudi, Kathak and Odissi. Getting their supplies from their workshop in Machlipatnam, the store, run by Gujaratis, caters to not only this need, but also has other costume jewellery for weddings and other functions.The Bharatnatyam and Kathak sets start at INR 2,000, and can go up to 2 lakhs, depending on the metal base. It’s a 40-year-old store and since the audience is typical to the area, it’s been flourishing all this while. While having a chat with them, they also mentioned how they lend their jewellery for important ad films in the market. But, what struck us was their sheer passion and dedication, going out of their way to explain what each piece stood for, and their loyal customers, who still bring invites to their dance performances so that they can spot what they’ve created. If you're in the area and are looking to make medium to heavy sets, visit the store and check out their brilliant collection, which can be gifted or just bought for yourself.